Referring to Fig. 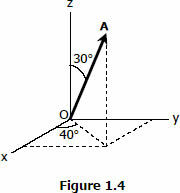 1.4, determine the angle between vector A and the y-axis. Which of the following correctly defines the 500 N force that passes from A(4, 0, 3) to B(0, 6, 0)?